Four “industry legends” spoke before a crowd of trucking executives at ATA’s Management Conference & Exhibition here Oct. 30. Bowman (top left), Sculley (top right), Weinrich-Lucht (bottom left) and Hodges (bottom right). The panel consisted of Don Bowman, chairman of D.M. Bowman Inc.; Tommy Hodges, chairman of Titan Transfer Inc. and former ATA chairman; Robert Sculley, president of the New Hampshire Motor Transport Association and executive director of the Vermont Bus and Truck Association; and Donna Weinrich-Lucht, president of Weinrich Truck Line. MCE has been characterized by a theme of unity and teamwork. During his state of the industry address Oct. 29, Spear expressed intent to strengthen partnerships with state association leaders, law enforcement officers and independent contractors. The legends commended Spear’s message of partnership. Sculley, who presides over associations with many small carriers, suggested that executives and big operators continue to consider input from smaller carriers in the future. Hodges said the industry used to be more of a “good-old-boys club” and praised the shift toward hearing from all members of the industry. The legends also agreed that the industry looks vastly different than it did when they entered the business, particularly with regard to technology. Weinrich-Lucht, whose son-in-law serves as her company’s IT person, said the technological shift has been one of the most dramatic differences. Looking toward the future, Sculley indicated that the labor shortage will remain a pressing problem. At an Oct. 29 MCE session, Elizabeth Lotardo, vice president of project management for McLeod and More, said the shortage is expected to surpass 63,000 drivers in 2018. The shortage once again ranked No. 1 on the American Transportation Research Institute’s critical issues report, which was released Oct. 29. 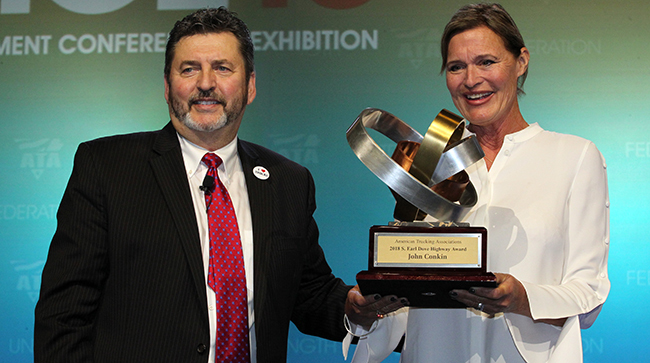 Prior to the panel, Kevin Burch, president of Jet Express and former ATA chairman, honored John Conkin with the S. Earl Dove Highways Award. Conkin, former ATA chairman and managing director at BMO Transportation Finance, died June 3 after a battle with cancer. He was 62. Named for former ATA Chairman and former owner of AAA Cooper Transportation S. Earl Dove, the award is the association’s highest honor.